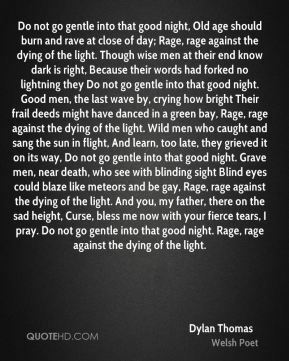 Do not go gentle into that good night, Old age should burn and rave at close of day; Rage, rage against the dying of the light. Though wise men at their end know dark is right, Because their words had forked no lightning they Do not go gentle into that good night. 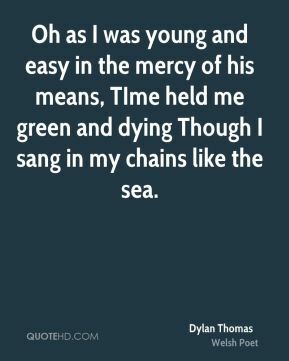 Good men, the last wave by, crying how bright Their frail deeds might have danced in a green bay, Rage, rage against the dying of the light. Wild men who caught and sang the sun in flight, And learn, too late, they grieved it on its way, Do not go gentle into that good night. Grave men, near death, who see with blinding sight Blind eyes could blaze like meteors and be gay, Rage, rage against the dying of the light. And you, my father, there on the sad height, Curse, bless me now with your fierce tears, I pray. Do not go gentle into that good night. 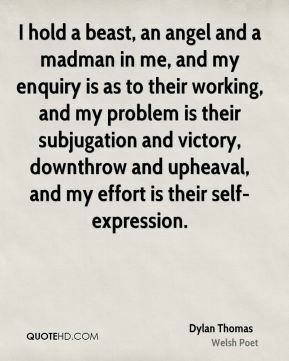 Rage, rage against the dying of the light. 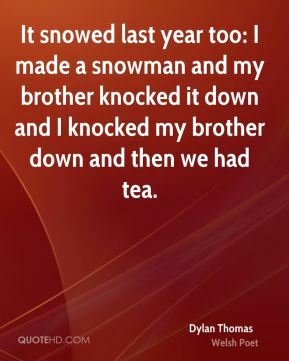 Wales is the land of my fathers. And my fathers can have it. 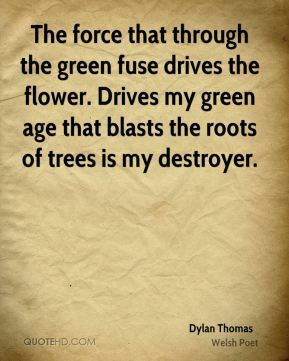 You can tear a poem apart to see what makes it tick... You're back with the mystery of having been moved by words. 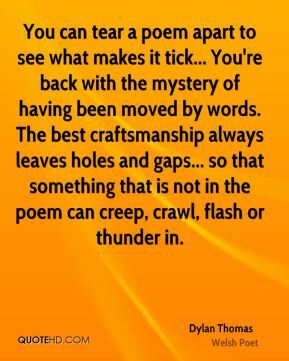 The best craftsmanship always leaves holes and gaps... so that something that is not in the poem can creep, crawl, flash or thunder in. 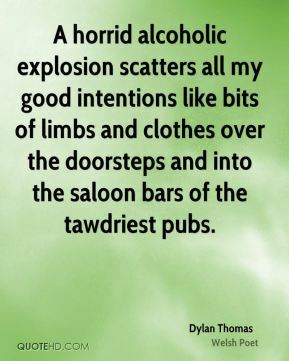 A horrid alcoholic explosion scatters all my good intentions like bits of limbs and clothes over the doorsteps and into the saloon bars of the tawdriest pubs. 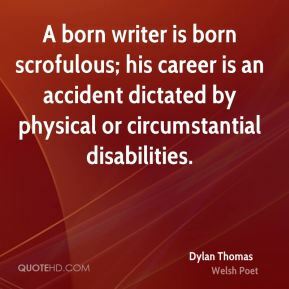 A born writer is born scrofulous; his career is an accident dictated by physical or circumstantial disabilities. 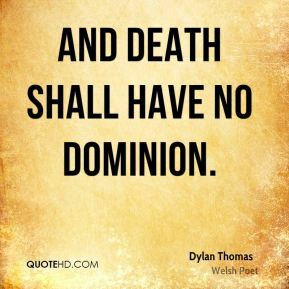 And death shall have no dominion. 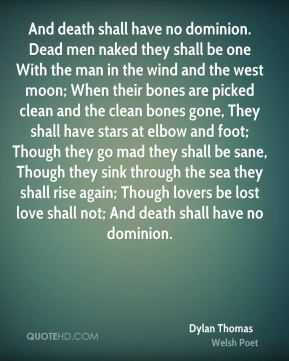 Dead men naked they shall be one With the man in the wind and the west moon; When their bones are picked clean and the clean bones gone, They shall have stars at elbow and foot; Though they go mad they shall be sane, Though they sink through the sea they shall rise again; Though lovers be lost love shall not; And death shall have no dominion. 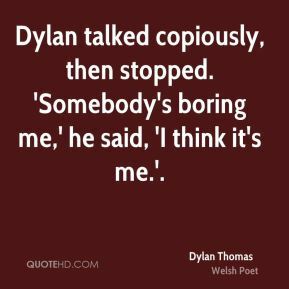 Dylan talked copiously, then stopped. 'Somebody's boring me,' he said, 'I think it's me.'. the land of my fathers . . . . I leave it to my fathers. 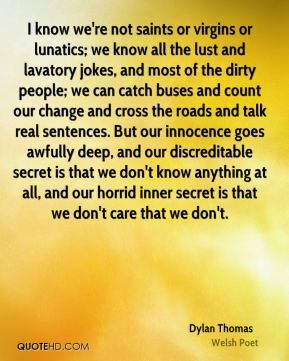 ... an ugly, lovely town ... crawling, sprawling ... by the side of a long and splendid curving shore. 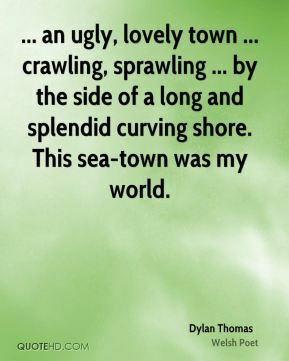 This sea-town was my world. 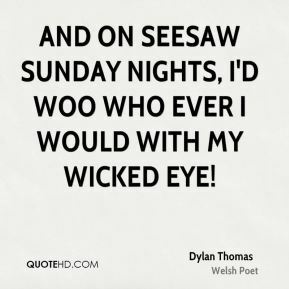 And on seesaw Sunday nights, I'd woo who ever I would with my wicked eye! We were just annoyed at being kicked off Main Street.